The Rocket Espresso Appartamento proves that great espresso doesn’t require a big machine. Designed for urbanites—or others who want a high performance machine in a small space—the Rocket Espresso Appartamento is a compact espresso machine that measures just 14.25 inches tall, 10.5 inches wide and 17 inches deep and offers features like a heat exchange boiler, articulated steam and hot water wands that allow you to produce barista-quality espresso at home. The size of this compact espresso machine doesn’t mean the Rocket Espresso Appartamento skimps on style. Thanks to its chic design, which features white or copper inserts peeking through stainless steel circular cutouts on the side panels and classic Rocket Espresso knobs, this small-but-stylish machine is attractive enough to leave on the countertop. 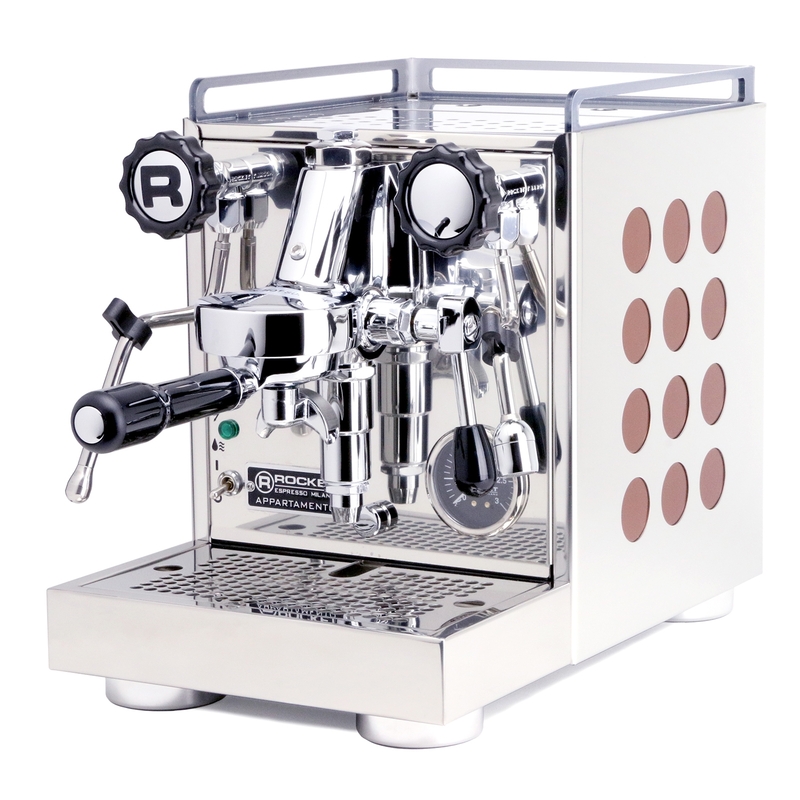 Rocket designed its Espresso Appartamento with the same attention to detail and high performance features of its larger machines, including a heat exchange boiler, articulated steam, hot water wands and spouted portafilters for both single and double shots. Despite its smaller footprint, the machine includes a 1.8-liber boiler, 2.25-liter water tank and E61 brew group. Making great espresso just got easier. The Rocket Espresso Appartamento pairs high quality functionality with features that make operation a breeze automatic pre-infusion, no-burn hot water and steam valves and an easy-to-access water tank. The Rocket Espresso Appartamento is available in stainless steel with white insert panels. It also includes extras like two complete 58 mm portafilters (one single, one double), a stainless steel buckflush disk, brush, plastic coffee scoop and metal tamper—everything you need to craft café quality espresso at home. I've been using the rocket grinder for about four months now, and it's great! Due to our lack of experience, it took us a couple days getting used to. But it’s getting better, and it’s definitely a great machine for home espresso. Love the Appartmento, my previous machine was a Breville. The Rocket has taken some time for me to learn and I can honestly say I’m starting to get it.